Jeanette is a strong-willed woman, diagnosed with cerebral palsy, epilepsy and profound mental retardation. She grew up in a state-run institution and at age 40 moved into a community-based residential program. I was introduced to Jeanette when she was 57. Determined and thoughtful, nonverbal and non-ambulatory, Jeanette had many barriers and limited opportunities. Jeanette demonstrated skills at a pre-symbolic level; she would not be able to successfully use the ‘standard’ Boardmaker line drawings or even colored photographs but rather needed ‘vocabulary’ that would be more concrete to represent her thoughts, ideas, and words. Following a comprehensive assessment, a program was established for her, consisting of training staff on how to teach Jeanette Object-Symbol vocabulary, how to assess Jeanette’s ability to understand and use her new tangible ‘words’ and what to do with the vocabulary once she acquired it. The following targets were identified for training. No one ever thought it would take just two weeks for Jeanette to communicate her first word! Staff at Jeanette’s home did a great job teaching Object-Symbols; prior to the activity represented staff would verbally label the upcoming activity as they showed and encourage Jeanette to feel and manipulate the Object-Symbol. Once they arrived at the activity location they again directed Jeanette attention’s to the Object-Symbol, pairing the activity with the Object-Symbol. Then again, during the activity they paired the Object-Symbol with the activity again, making the connection. They did this with all the Object-Symbols listed, each time Jeanette participated in one of the listed activities. Obviously some Object-Symbol had more training than others, ‘Toilet’ obviously had a lot of training, every two hours Jeanette was handed the TP roll, told she was going to go to go sit on the toilet and was then wheeled to the toilet, where she sat on the toilet, had her wet Attends changed and was cleaned up. One day, a short two weeks into the training, staff noted Jeanette was ‘fussy’, not wanting to participate in any activity staff tried to engage her and seemingly very discontent. In a last ditch effort, a staff member placed the basket containing the Object-Symbol staff used for training on Jeanette’s lap and asked her, “What do you want?” Jeanette then looked up at staff and began rummaging through the basket of Object-Symbols; she then lifted her hand to staff and handed them the TP Roll! Astonished, the staff immediately took Jeanette to the toilet, where she successfully urinated in the toilet FOR THE FIRST TIME IN HER LIFE! To this day, Jeanette is content, she no longer requires Attends during the day and she has dignity. 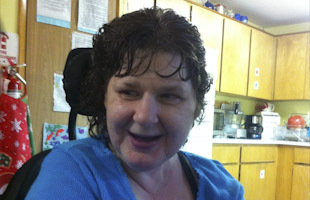 She also has a lot to say, with over 20 known Object-Symbols used on her Communication and Choice Boards, Jeanette is now an active participate in her care and her life, indicating preference, choices and basic needs utilizing a growing repertoire of Object-Symbols! Click here to see Jeanette and what successful communication looks like!